There has been some spray action in the town of Aalborg in Denmark lately for the “Out in the Open” mural project initiated by Gallery Kirk. They invited high-profile street artists to do what they do best! With a great project ethos check out below to see for yourself what is happening in the town of Aalborg. Australian street artist, Guido Van Helten finished two large murals. Guido has in recent years built up a career as a street art artist performing very powerful portraits often of site specific individuals around the world. The work can be seen at “Eternitten” in Aalborg, as a part of the story of the worker at the old eternit factory that was once here, which for many years had great significance for many people in the city. Inside the silo there will then be established a workers museum, telling the story of the site. Conor Harrington finished mural is of his classic colonial style which we love. The area and the massive building chosen for the Conor Harrington among others turned out to be the perfect site for one of his signature colonial characters. The buildings at the street of the mural made the perfect surroundings for his piece since most of them are historic buildings. With this as a background the ancient history of the work gets emphasised even further and underlines the context even more. 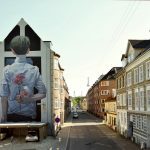 South african self-taught street artist faith47 has been busy in Denmark with this huge mural of a young boy. Located in the rejuvenated freight and railroad district, the mural reflects on the working-class history of the site. It depicts a worker that was part of building the railroad int the 1800. With her very caracteristic strokes Faith47 has managed to make another amazingly strong portrait as part of the history of the place. The Mural stands clearly along the Øster Allé bridge in downtown Aalborg. Sepe & Tone contribution to the festival is titled ‘Mayday Mayday’. The mural came from the inspiration when the artists were reading about Denmark and how the country is very flat and all very close to the cost. This means that in case of a continuing global warming the a lot of the country could get flooded. Therefore the two figures in the mural are watching out for help with the water going to their ankles with big windmills in the background. Check back at a later date for all the action in Aalborg! We can not wait!